A graveyard… that is how Olivia Nuzzi, writer for The Daily Beast online periodical, describes the appearance of Atlantic City today. A funeral parlor near to the Taj Mahal helps to emphasize it and foreshadows the imminent “death” of this luxurious casino and resort. 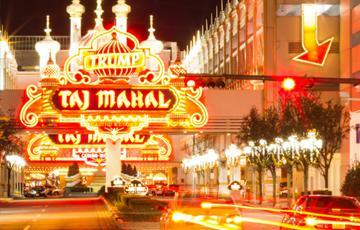 The Trump Taj Mahal is to be the fifth casino in Atlantic City to close in the last year. In her article, she paints a very dismal, lifeless, desolate, and depressing scene of Atlantic City and the Taj Mahal itself. Despite the crumbling and deserted surroundings, a few casino regulars still show up to play the slot machines. Olivia mentions a couple of elderly folks, Tony and Cathy, which were regulars in Atlantic City. They contentedly play the slot machines as Olivia interviews them. They tell Olivia that they have been coming to Atlantic City since from Gloucester County since gambling was legalized in Atlantic City in 1976. They used to go to the Trump Plaza, they said, but that casino shut down. Since then they began coming to the Tal Mahal. The Taj is scheduled to shut down just like the others this coming Friday, December 12th. As a matter of fact, last Monday Trump Entertainment Resorts announced the premature closing of one of the two hotel towers, the Chairman’s Tower. Moreover, the casino would no longer be issuing credit. Donald Trump, the ex-owner and CEO of Trump Entertainment Resorts, told Nuzzi that the recent occurrences in Atlantic City are a sad sight. “It’s so sad to see what’s happened,” Trump told Nuzzi, “I left years ago. I got extremely lucky. My timing was extremely good – through talent or luck, I’m not sure.” Currently, Trump still owns barely a 10 percent stake in Trump Entertainment Resorts and is quite resolute to make sure no one thinks he has any involvement at all with the derelict Taj Mahal. The glamorous and renowned Taj Mahal opened in 1990, and at that time it was even declared the “Eighth Wonder of the World” by Trump’s publicists. At 17 acres and $1.2 billion, it was the largest and most expensive gambling house ever constructed at that time. Atlantic City has a history of getting left behind in the times in comparison to the rest of the country, or at least the region. The booming tourism-based economy of Atlantic City began its first decline in the mid-1960s. The seaside town did not look up until 1976 when Governor Brendan Byrne legalized gambling. This guided in a new yet rather unbalanced boom. The area surrounding the casinos was generally neglected. For example, Atlantic City did not get its first supermarket until 1996. The place also never looked to open up more family-friendly options for those who wished that alternative, and it never achieved the same glamour that Las Vegas attained. On top of that, the city was afflicted by a number of social maladies.